A passionate study of the fascinating world of gemstones. Beauty, mystery, intrigue, and obsession are to be found in the gem world. This will be a guided tour of that sphere. 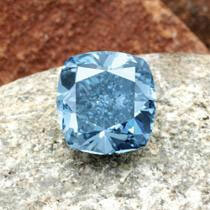 Diamonds, emeralds, rubies, sapphires and more will be featured on this site. I will look at the history and the beauty of gemstones. The most fabulous treasure ever found. It is remarkable that this gem has been mined in Afghanistan for at least 5,000 years. The Egyptians were very fond of lapis and used it extensively along with gold, carnelian and turquoise. The fabulous gold piece above is circa 850 B.C. 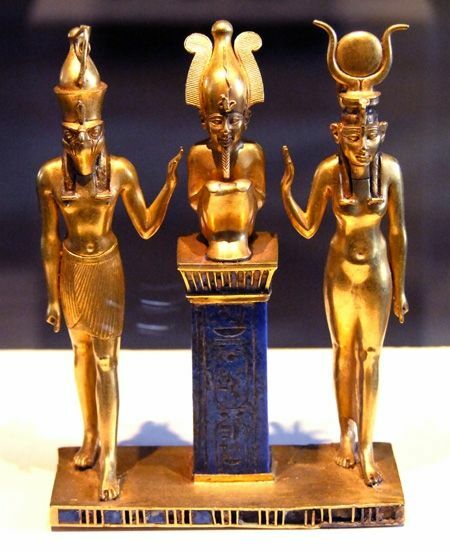 and consists of gold statues of Osiris flanked by his son Horus and his wife Isis. Osiris sits on a column of solid lapis, engraved with hieroglyphics and they all stand on a golden base with lapis inlay. It is in the Louvre as well. In the early 1970s lapis was controlled through a state gem corporation in Adghanistan and in those days, it was very difficult to obtain. The early '70's was certainly a better time for that tragic country. Afghanistan had a king and was a relatively peaceful place. However, the king was deposed in 1973 and a long and tragic struggle for power ensued to this day. In 1979 the Soviet Union invaded and started a decade long war in Afghanistan. During that time the mujahadin started to export lapis as a source of funds to buy arms and munitions to fight the invading Russians. I dealt with several of these fierce Afghan fighters who would come to the Tucson Gem Show to sell lapis and other gems found in the mountains of Afghanistan like tourmaline, aquamarine, kunzite, morganite and topaz. I recall seeing one lot of tourmaline for sale by some Afghan warriors. The lot included a photo of a Russian tank that they had blown up. In the tank, was a cache of tourmaline crystals. The Russians had killed some Afghan miners and stolen their tourmalines and then other Afghans killed the Russians and retrieved the gems. The path a gemstone takes from the ground to a finished piece of jewellery is sometimes twisted and tragic. There are new stones being added on a fairly frequent basis, so you might want to check out my website from time to time. The first great flowering of the jeweler's art took place in ancient Egypt where the goldsmith and the gem cutter first created some of the greatest and most beautiful jewellery of all time. 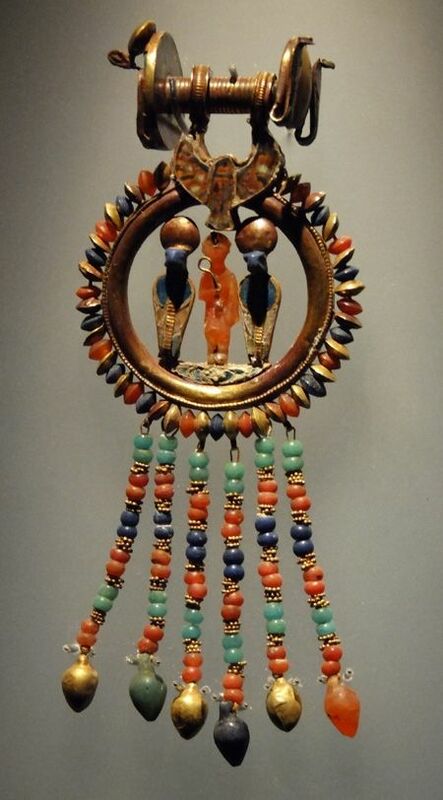 The naturalistic images masterfully portrayed were made with lapis lazuli, carnelian, turquoise, garnet and faience (glass). The egyptians portrayed their gods or natural motifs like animals, lotus or papyrus with exquisite craftsmanship and design. Many of the Egyptian designs have the same power and appeal as they did thousands of years ago. King Tutankhamen's tomb discovered in 1924 by British archeologist Howard Carter, gave us the greatest insight into Egyptian jewellery and gem use. This winged scarab is one of the many fabulous jewelry items found in Tut's tomb. It is marvelously inlaid with lapis lazuli, turquoise, carnelain and glass. 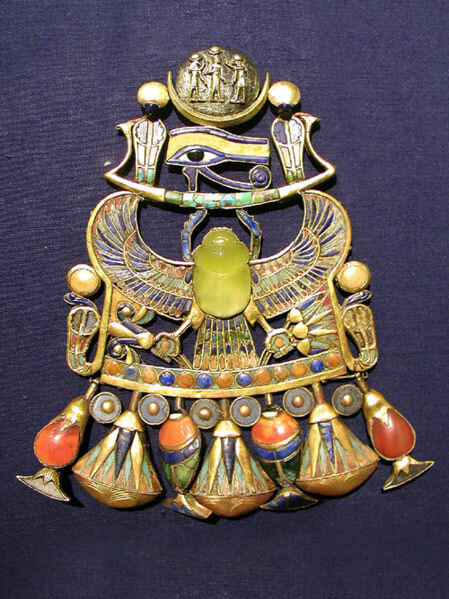 The winged chalcedony scarab is the centrepiece surmounted by the ever-mysterious eye of Horus inlaid with lapis lazuli. In January of 1974, Arizona Highways published a fabulous edition dedicated to turquoise and the native art of silver and turquoise jewellery. At that time, I had a shop on 4th Avenue in Vancouver selling my own silver jewellery and leather goods crafted by my friend David Luce. That was the height of the hippie era and the prevailing jewellery trend was turquoise and silver from the Southwest - primarily Arizona, Nevada and New Mexico. Young hip capitalists would journey to the southwest to trade for turquoise, and turquoise set jewellery from the Native tribes like Zuni , Navajo, and Hopi. 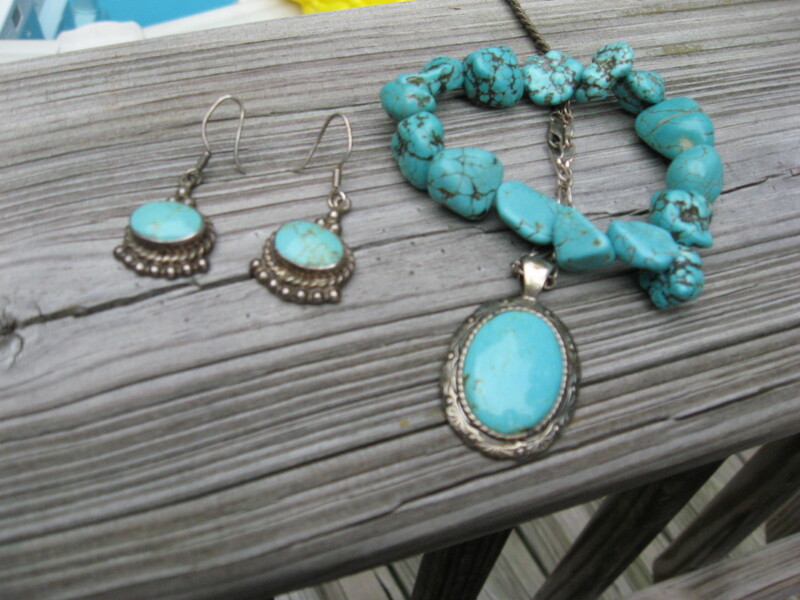 North America was turquoise crazy in the early '70's and I cut my teeth as a silversmith and gem aficionado making turquoise and silver jewellery in the style of the Southwest. I guess I did a pretty good job because I made and sold a bracelet to a customer one week and the next week saw the same bracelet in an antique shop being sold as a genuine Navajo antique - caveat emptor! We will send you our latest edition as a PDF file and hope you enjoy! Jasper is the variety of crypto-crystalline quartz with the greatest power to inspire the 'wow' factor. 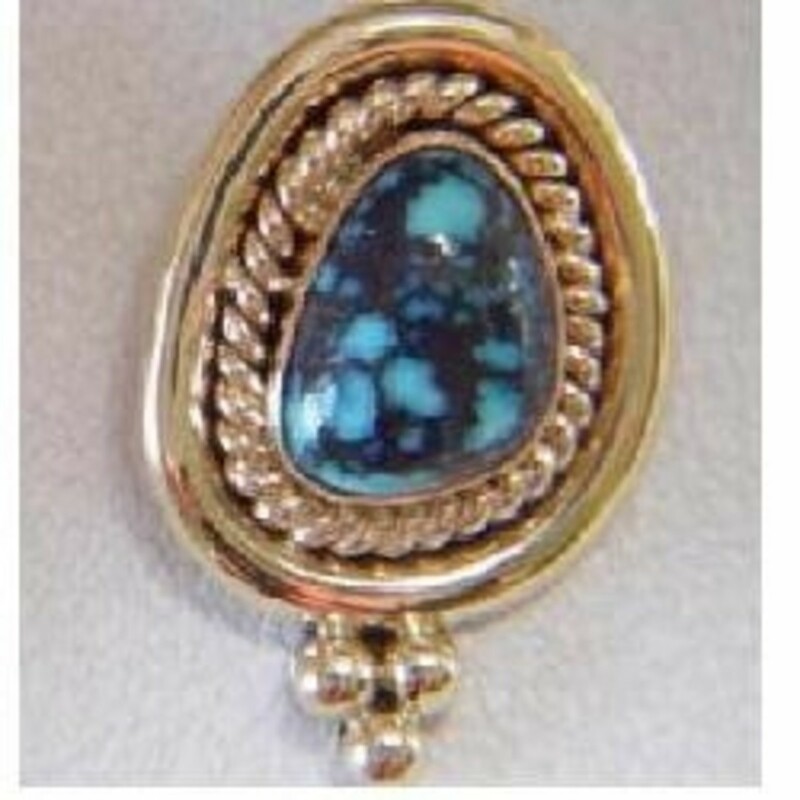 It was seeing wildhorse picture jasper in the mid 1970s that inspired me to become a gem dealer. What is it about jasper that has that power? 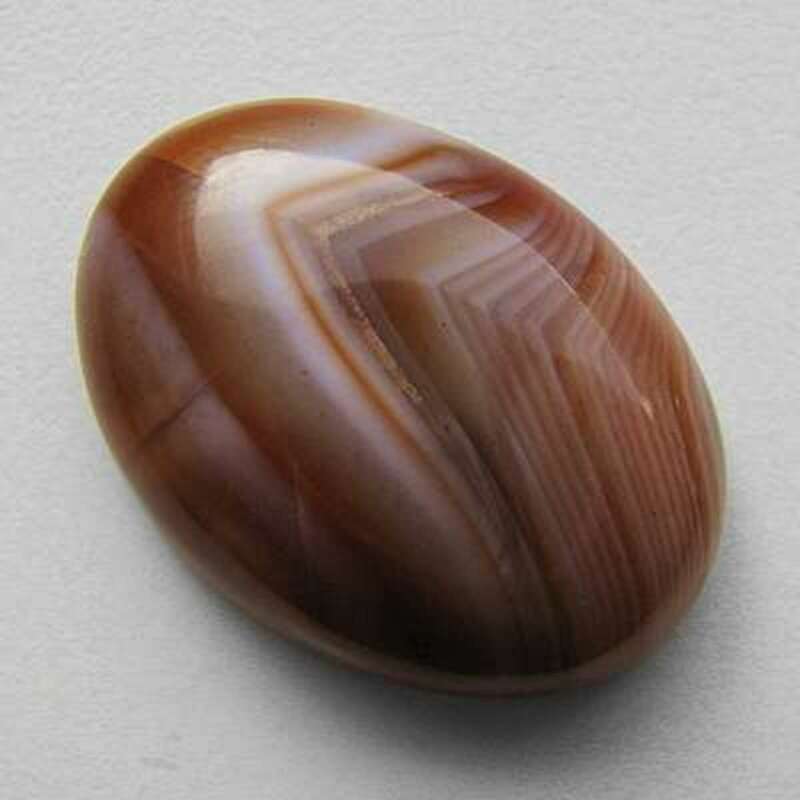 Typical jasper is an opaque densely-coloured semi-precious gemstone, most often seen in a red hue, but it can be virtually any colour. Where it starts to amaze when the jasper is form in plastic layers which create fantastic landscapes of hills, canyons, blue-skied deserts, populated by dendritic sagebrush. These are called picture jaspers and in the Western USA, there have been discovered the greatest pisture jaspers in the world. These are found in the states of Oregon and Idaho. 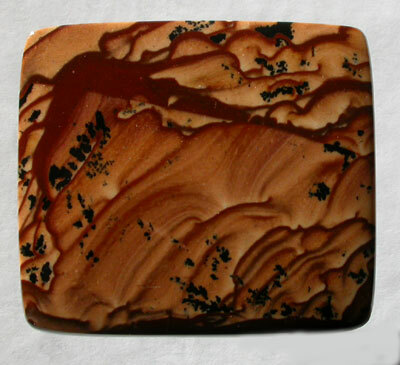 We will discuss the major varieties of picture jasper from this region. 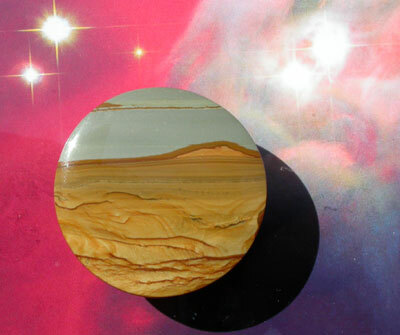 For those of you who are fans of unique, beautiful and fabulous gemstones you must check out http://www.rareandprecious.com You will find a continually changing and growing collection of designer cabochons. 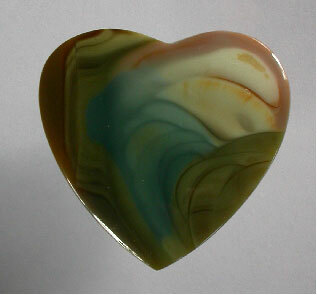 This is the jasper that started my fascination with gemstones. 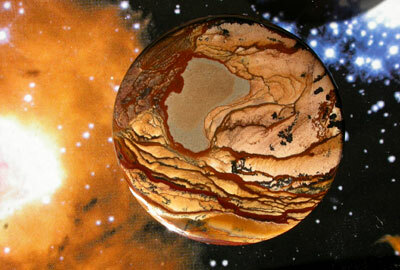 Wildhorse Jasper creates stunning landscapes that are almost surreal. It somehow represents the Western USA pictorially with the clear blue sky and mountainous desert landscape. Ironically, that is where it is found, in Owyhee county in southern Idaho and eastern Oregon. The 1960s seemed to be the era of discovery for jasper in Oregon and Idaho. Owyhee Jasper is one of the most dramatic jaspers with the combination of red, creamy white, ochre and black. There is somehow a Japanese sense of aesthetics in some of these stones. A man by the name of Bruce Markus has been reported to have discovered this gemstone while chasing wild horses in his VW bug. It was really just a matter of luck, having stopped at the top of a hill. He and a friend got out to look around and stumbled across small boulders of what was to become known as Owyhee Picture Jasper. According to reports, he and his companion picked up about 300 lbs. of the rough in an hour or so and was able to sell it easily to a local rock shop. He staked a claim and started producing this jasper. As with most deposits of this kind, the supply is finite and will someday be depleted. Every serious collector of fine picture jasper must have at least one Owyhee Picture Jasper. This is now one of the most highly prized jaspers and for good reason. It comes in an amazing array of colours and colour combinations including blue-green, pink, orangy-brown and red. It is reported to be found in Zacatecas, Mexico about 50 miles north of Guadalajara. There are two varieties - one called Imperial Jasper and the other called Royal Imperial Jasper. Biggs Jasper was discovered after a flood had washed out the bridges and the highway that ran througha little town in Oregon called Biggs Junction. This was in 1964 and the flood blasted away the overburden and left these amazing boulders in its wake. A highway crew was in the area building a new road and they went to work repairing the road and bridges that were washed out by the flood. As they came across this unusual boulders, their reaction was like that of virtually anyone who sees their first piece of this incredible material - amazement. They started collecting it and brought it back to the motel where they were staying where the owner, Isami Tsubota was captivated by theses stunning rocks. He started gathering the washed out boulders and set up a rock shop to sell them. The rest, as they say, is history. In general there are two kinds of Biggs jasper, the chocolate browns such as the one on the previous page which is what people generally associate with Biggs Jasper and a much less common variety with a bluish/grey field with chocolate brown flow lines. This is known as Blue Biggs and is highly prized by collectors. It is found in the same region of Oregon near Biggs Junction. Native Americans had used Jaspers from this region long before settlers came form other parts of the world. A man named Hoot Elkins discovered a 15 ft deep pit that aboriginals had dug situated on the side of a hill overlooking the Columbia River. Within that pit and contained in one five acre area was the world's sole source of Deschutes Jasper. It is probably the rarest of the jaspers from Oregon and certainly, one of the most beautiful. 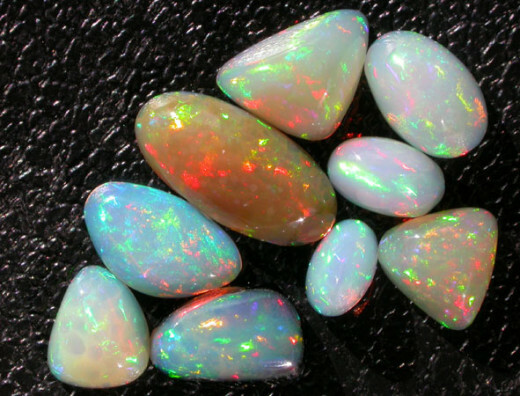 Within the last 3 or 4 years, fabulous opal has been coming from Ethiopia. As is often the case with a new discovery, there was skepticism at first about the stability of the Ethiopian material - was it stable? Well after more than 3 years on the market, it has proven to be full of fire and very stable. It was very reasonably priced initially, so gems on the market right now offer exceptional value compared to Australian opal, however, don't expect that disparity to last much longer. After quartz, garnet is probably the most abundant gemstone on Earth. It's use by ancients was fairly widespread from the Greeks to the Anglo-Saxons. In studying ancient the use of ancient gems, you'll come across the earliest gems such as lapis lazuli, carnelian, and turquoise in the ancient Mesopotamian and Egyptian jewellery. The very earliest gems were used for sealing stones and hardness and durability were critical for those functions. Garnets have been found in archeological discoveries as far back as 3,000 BC. However, it is the Greeks who start using garnets with regularity and the wine-red gems found favour with them. The first garnets were fashioned en cabochon or shaped into a design like Hercules knot. They were also used for engraved stones. The garnets used in this ancient Greek jewellery is of the almandine/pyrope variety. 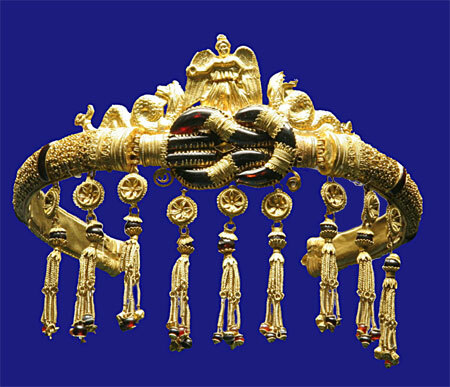 Photo: Ancient Greek jewelry from Pontika (now Ukraine) 300 BC. It is formed in a Heracles knot. Photo: By Author of grossular garnet hessonite variety from Mount Jeffrey Mine in Quebec. and Hades must obey the supreme god. Hades loved Persophone and wanted her to return so he gave her a gift, a pomegranate. The word comes from the Latin - pomme which means apple and granatus for seed. Hades knew Persephone would love the sweet fruit and she did, returning for three months every year which caused winter to return. The pomegranate (and garnet) is associated with eternity. It has also been believed that garnet is a stone for loved ones who are away from home and can heal broken bonds between estranged lovers. The Roman name for her was Prosperine. This variety takes you outside the typical garnet expectations of a red gemstone. 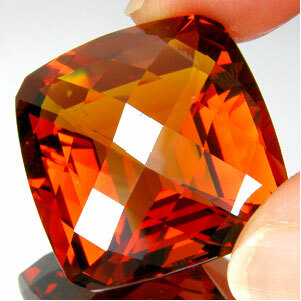 Grossular garnets come in a variety of colours including, orangy-brown, green, yellow and colourless. One of the great mineral locations in the world is the Mount Jeffery Mine in Asbestos Quebec. Pure grossular garnet is colourless, and this locality has some very unique colourless garnet crystals with chromium centres, illustrated above. 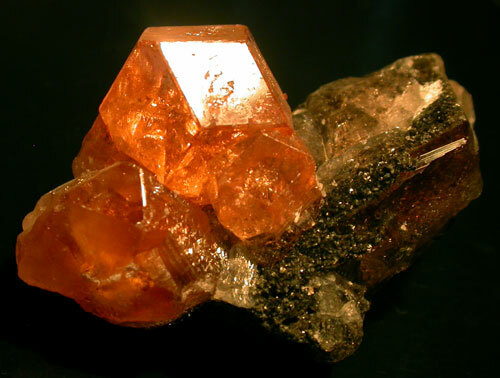 Several spectacular varieties of grossular garnet have been found there, including the orangy brown variety illustrated here, known as Hessonite. 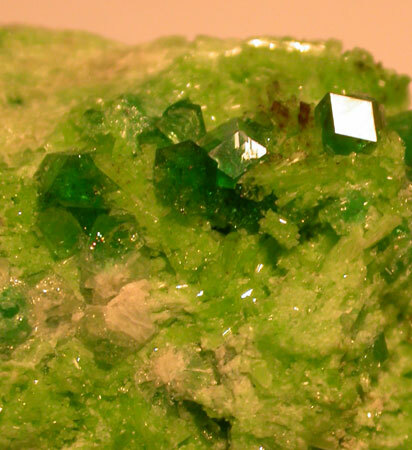 There is also an emerald-green variety found there which has come to be known as Tsavorite from the subsequent discovery of commercial quantities of green garnet in the region of the Tsavo National Park of Kenya and Tanzania. After the discovery of Tsavorites in East Africa, the search for gems intensified and many different colours and varieities were found. These included stones that ranged from colourless through to yellow, green and various shades of orangy brown. This is another illustration form Precious Stones and Gems, by Edwin STreeter, published by George Bell & Sons, 1898. Liddicoatite is a variety of tourmaline from Madagascar with incredible geometric patterns that change throughout the length of the crystal. All of the slices shown in this video come from the same crystal! I once had a set of fabulous Liddicoatite and was visiting the GIA in Santa Monica, California. I thought there might be someone there who would be particularly interested in seeing these slices. After a brief inquiry in the headquarters, I was ushered in to meet the man after whom this gemstone was named - the American Father of Gemology", Richard Liddicoat. He was delighted to see a very spectacular collection of his namesake gemstone! If you are starting a study of gemstones, this is the first book you should own. It is very complete and well-organized (It is by a German!) 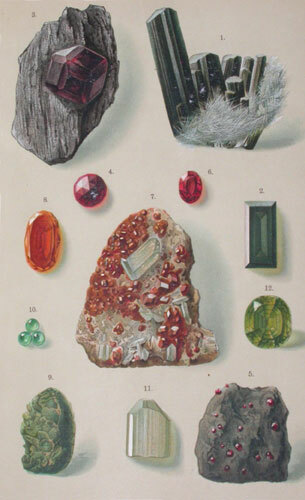 Schumann has organized the major gemstones in a very logical and informative format with illustrations on every page. 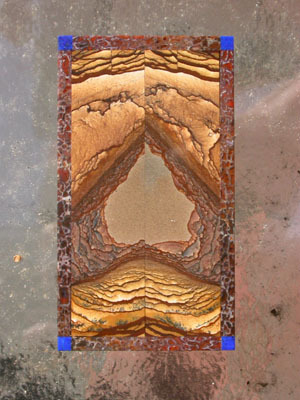 It contains a good balance between technical information and colour photographs showing gemstones in rough and polished states. I'm most impressed with the jadeite necklace and ring. Cryptocrystalline quartz comes in many colours and by many names. Orange chalcedony is called carnelian, there are two types of green chalcedony - chrysoprase - a bright apple green stone from Australia and chrome chalcedony, also known as Mtorolite which comes from Zimbabwe in Africa. Oregon contributes a purple chalcedony called Holly Blue and then of course there's the grayish blue variety known as Blue chalcedony. The different colours are caused by trace elements in the chalcedony. 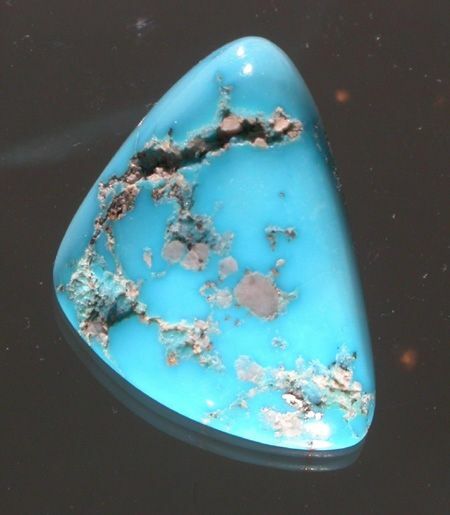 The most valuable variety is coloured by copper and is an intense turquoise blue variety known as gem silica. It has been found in the copper mines of Arizona and Peru. It is also associated with other copper minerals, like malachite and chrysocolla. In all of its varieties, chalcedony is an excellent jewellery stone, with a hardness of 7 and the cryptocrystalline structure it is durable and beautiful. It is also suited for gem carving because of the above-mentioned properties. The ancients often used chalcedony to make sealing stones and beautiful examples of Greek, Mesopotamian, and Roman gems can be found in ancient gem collections. 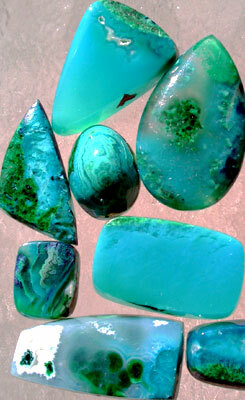 The most valuable variety is coloured by copper and is an intense turquoise blue variety known as gem silica. It has been found in the copper mines of Arizona and Peru. It is also associated with other copper minerals, like malachite and chrysocolla. Gem silica is quite rare and can command from $10 to over $100 per carat for the fine quality gems. Today it is very hard to come by since the best material was mined several decades before. The reddish-brown or orange variety of chalcedony known as carnelian is one of the very earliest gems used by humankind. The reason for this is simple, it is relatively common being a variety of cryptocrystalline quartz coloured by iron oxide another relatively common occurrence. Carnelian has been found in the jewellery of many ancient cultures. 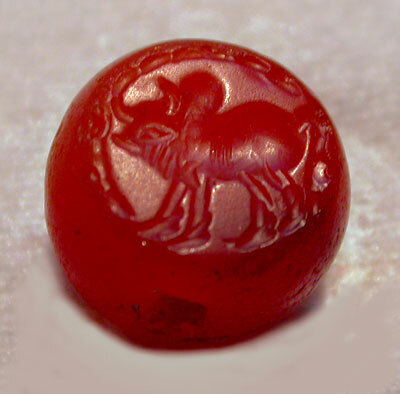 The Mesopatians, the Egyptians were using carnelian as early as 4000 B.C.E. In ancient Mesopotamia carnelian was used for beads and by 2500 BC was being combined with lapis lazuli and and gold to make stunning necklaces. In Egypt, carnelian beads shaped like pomegranates were used interspersed with round beads in necklaces. Carnelian has always been a popular gem for making sealing stones. The Romans used them extensively as did the Persians during their Sassanid Period (224 AD to 651 AD). The Romans tended to be flat stones cut intaglio style with images of roman gods or goddesses. The Persian's sealing stones were orb shaped with a flattened face and a hole drilled through the middle so it could be worn as a bead. It is easy to imagine early humans foraging along a river's edge, looking for food and useful rocks and coming across a pretty pebble. Their eyes, like ours would be attracted to a bright red jasper, or a striped and colorful agate. We do the same today. Occasionally, an exceptional stone would be found. A ruby pebble, a luminous piece of jade, perhaps even a diamond. From time to time a rock may have been found that resembled an animal. It too would be an object of potential power and ritual. By exploiting the different hardness of various stones, arrow and spearheads could be knapped and animal-shaped stones could be carved into even more realistic forms. Because of their durability, many of these ancient objects remain today, virtually unchanged through the ages. By learning through the ages about the different properties of different stones, people assembled a technology that allowed them to transform rocks into objects. Objects of utility, objects of ritual and objects of beauty. Gemstones evolved from chance-encountered objects to objects of adornment and utility by the development of the shaping technology that transpired over millenia. When you embark upon the study of gemstones, you begin a journey into the history of mankind and civilization. For example, gems are essentially linked with the development of writing and the creation of legal documents. How so? Cafe Press Shop with cool products using exclusive images from Green Oasis soothing and beautiful garden images on T-shirts, cards, coffee mugs and more! A glimpse into the fascinating world of diamonds. Everything you wanted to know about the Ruby gemstone. Legends, myths, lore and history of rubies. Famous ruby gems and their owners. Ruby gem mining locations and of course beautiful ruby jewelry. In Mesopotamia, the area between the Tigris and the Euphrates (modern-day Iraq}, earliest agricultural societies developed. With agriculture, civilization rapidly advanced. Agriculture sometimes created surplus. It also created specialization. Some people became farmers, other were warriors. Others- merchants. Surplus and specialization led to trade. With trade, record keeping and legal contracts evolved and those required some form of writing. Since writing was a very arcane form of knowledge restricted to the scribes, a way needed to be devised to create a legal signature for those who entered into contracts, but could nor write. Gemstones provided the answer. By around 300 BC the technology for shaping and carving stones had developed to the point where small images could be engraved into a hard and durable stone, like an agate or jasper. That image was unique and when pressed into a wet piece of clay left an impression or seal. 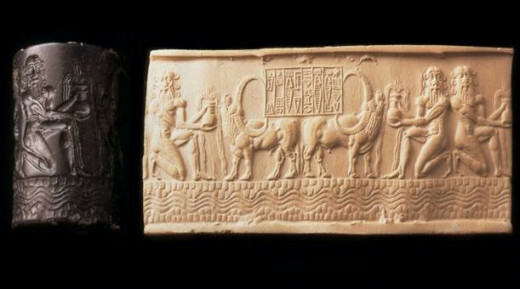 Since clay tablets were used for creating and keeping records, this became an effective way to create a unique and verifiable signature on a document, or to seal up a grain storage facility. 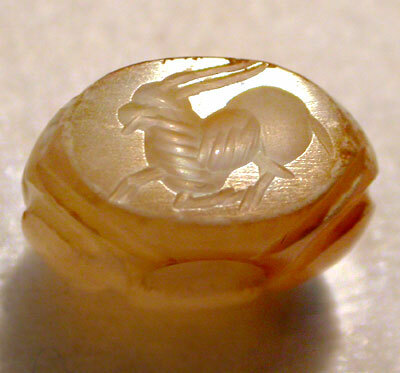 For thousands of years gemstones seals depicted people and animals in the middle east. With the overthrow of the Sassanid empire in the 7th century, that tradition ceased. Under Muslim rule the depiction of images was forbidden and the last carving of the beautiful ibex, or the winged horse above were engraved. From the mid 600's gem engraving in the Arab and Muslim world was solely focused on script or geometric designs. These seals are generally in some form of agate or chalcedony. The Greeks were not lavish in their use of gems, probably because they didn't produce many. 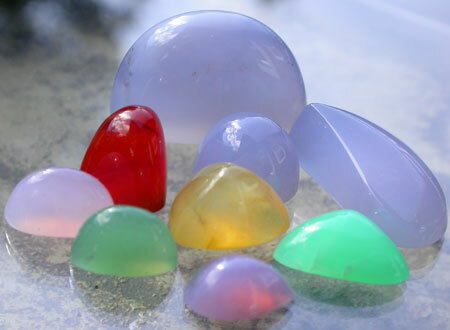 The primary uses of gemstones were as sealing stones, usually of agate or some other form of chalcedony. These stones were usually scaraboid in shape. The carvings were often masterpieces of miniature sculpture like the carnelian portrait of a youth adjusting his sandal dates from around 500 BC and is attributed to a carver known as Epimenes. Garnets were also popular in Ancient Greece during the Hellenistic period (330 to 27 BC). Garnets seem to have been the stone of choice on Ancient Greece, cut en cabochon or sometimes engraved intaglio style. In fact, in my research, garnet of the dark wine red variety which is generlaly the almandine/pyrope variety seems to be the most common of the transparent gemstones in the anclient Mediterranean region. No doubt it was the most common and in fact if you spend time on the Fraser River near Yale, BC you will find areas of natural concentration of black magnetite sand overlayed with thousands of small garnet crystals, attesting to their relatively common distribution in granitic regions. 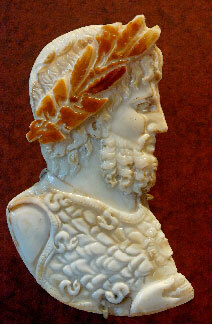 Sardonyx cameo representing a hellenistic king as Ares, 2nd century BC. By the 5th century B.C., the art of the intaglio was fully developed. 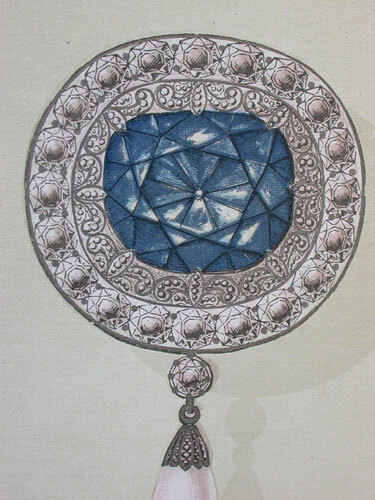 Intaglio style carving is done in reverse, so the the carving cuts into and below the surface of the gem. This leaves a positive or raised impression when pressed into a soft material like clay or molten wax. The reason for the existence of sealing stones was originally to impress a legal and verifiable "seal of approval" into one of these substances. Human nature being what it is, the desire to create and own something beautiful, led craftsmen and artists to produce something more than utilitarian. 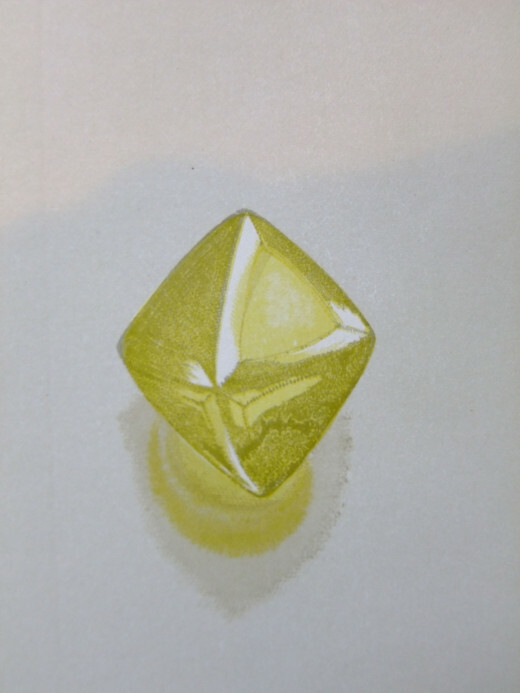 The first recognized master of the gemstone art was Dexamenos of Chios. There are four gems in existence attributed to him. The finest of the gems illustrated here resides in the Hermitage in St. Petersburg, Russia. It is a blue chalcedony carving of a heron, executed with a mastery and delicacy unrivaled for its time. The other carving in the Hermitage is also a heron with its leg raised about to catch a grashopper. These pieces transcend mere illustration and enter the realm of art. In the world of gems, Dexamenos was the first rock star. No doubt Dexamenos created hundreds of gems in his lifetime and they await discovery. 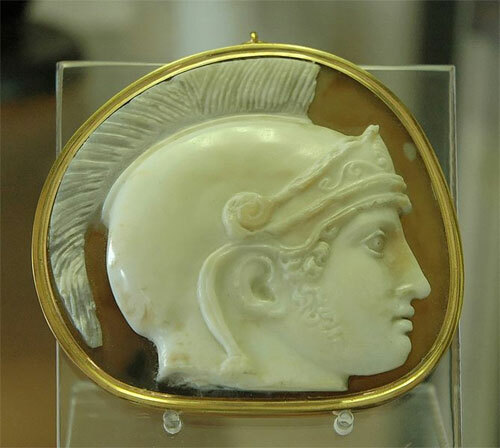 The ancient Greeks discovered the technique of cameo carving, which was later perfected by the Romans. The layering of agate makes the art of cameo carving possible. The Greeks discovered that by using the alternate layers of colour, portraits of great detail and artistry could be achieved. 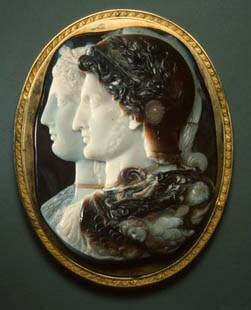 The ancients used the cameo to portray their gods, emperors and important people. During the Renaissance, fantastic objets such as this ornate pitcher were created by Italian craftsmen for their noble patrons. These can be found in European museums such as the Louvre with it's collection of fabulous objets in Louis XIVth's Galerie d'Apollon. Jupiter's head crowned with laurel and ivy. Sardonyx cameo. The Greeks developed the cameo sometime after the 5th century B.C. This took the gem from having a practical purpose, ie. as a sealing stone and therefore carved intaglio-style, to a strictly decorative item. The cameo is pure adornment and allowed the gem carver to create miniature sculptures. Agate was the ideal material, because the banding allowed for the very effective layering of the white layer against a dark background. After centuries of carving in reverse, it must have been a sensation to have seen the first cameos. Obviously, the idea caught on and was embraced by the Romans as we will see in the next chapter. Here are some books I have recently bought. I love this book - fantastic jewellery and that fact that I know a lot of the people included makes it very personal. Very inspirational for jewellery designers! At its height, the Roman Empire encompassed the entire Mediterranean region, stretching north into Great Britain, to the west all of France, Spain and Portugal, to the south Egypt and Northern Africa and to the west the Levant. The Roman art was heavily influenced by the Greeks and gemstones played an increasingly important role in the jewellery. The Romans were prolific in their use of carved gems favouring the usual agates, chalcedonies, jaspers and garnets. They were used in rings and pendants and portrayed similar motifs to the Greeks. Gods, animals and hunting scenes were the most common. In the photo to the left, we see a collection called the Fortress Bath Gems. The 88 gems were found in the sediment beneath a large drain underneath the ancient Roman Baths in Caerlon Wales. As you can see, there were many carnelian and jaspers, smaller numbers of amethysts and perhaps one or two garnets. Some of them may also be glass. It would appear that owning a carved gemstone was very common. They fell out of the rings of bathers between 75 and 230 AD. So about once every two years for almost two centuries someone emerged from the bath will a big space in their ring. This collection is in the Caerlon Roman Legion Museum, Caerlon, Newport, Wales. Although the Middle Ages is seen as a backward time, the artistry and technology of the goldsmith and the gem cutters rivaled that of the ancient Egyptians by the 7th century A.D. A stunning example of this was the treasure found at Sutton Hoo in England. Sutton Hoo is a group of Anglo-Saxon burial mounds overlooking the River Deben in south-east Suffolk, England. It is thought that this treasure, found buried in a ship, belonged to Raedwald, King of East Anglia who ruled from c.599 to 625AD. 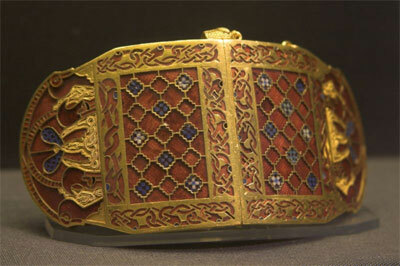 The workmanship of the gold pieces is stunning as illustrated here with a pair of shoulder clasps inlaid with garnets. This is a very effective use of almandine/pyrope garnet which tends to be rather dark. By slicing or grinding it into thin cloissones, back with a reflective gold surface, a rich transparent effect is created. The delicacy and the precision of the gold cloissones and the gemstone inlay is remarkable. Considering that these craftsmen had no power tools to work with, their excellence is all the more remarkable. It also illustrates why we find these noble materials of gold, silver and gemstones so appealing. They stand the test of time. This treasure was buried for more than a thousand years and yet we can look upon it today and get a glimpse into the culture and the minds of the people of that time. They obviously had an acute sense of beauty, an appreciation for exquisite workmanship and a highly evolved sense of design. It would seem, that except for the great passage of time, they were much like we are today. By the late middle Ages, as the lapidary's technical abilities advanced, harder stones like sapphire were used. Faceted stones had not yet been introduced and wouldn't be until the Renaissance, starting in the late 14th century. 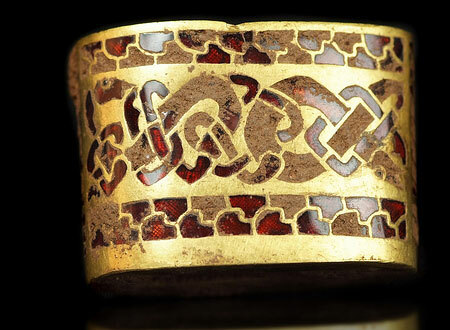 A stunning discovery of an ancient Anglo-Saxon hoard of treasure has been made in a farmer's filed in Staffordshire, UK. It has been described as an uparalled treasure from around 700 AD. See the Video. The man who found Britain's greatest Anglo-Saxon Treasure in a farmer's field, with a metal detector. 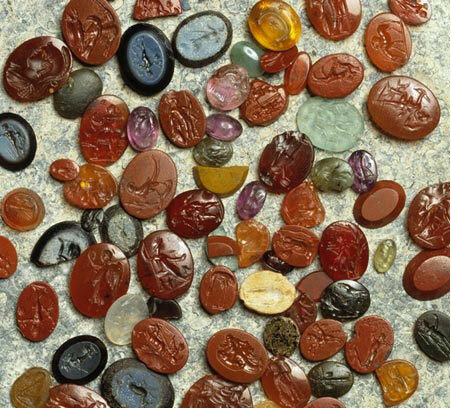 The use of gemstones exploded during and after the Renaissance. The exploration and colonization of the Orient and the New World brought new sources of exotic gems to Europe. Diamonds from India, sapphires from Ceylon and emeralds from South America enriched the European colonizers coffers. 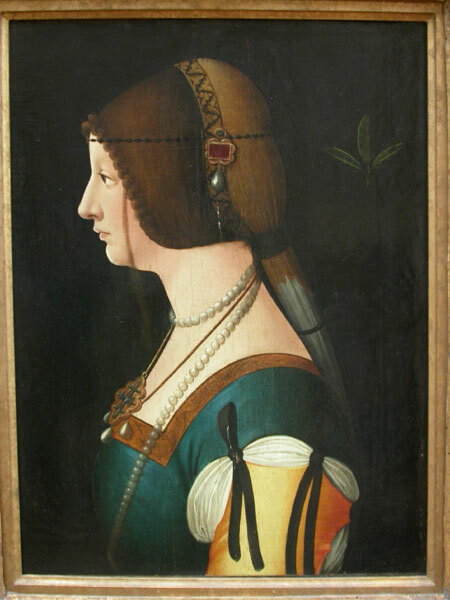 Pearls were a very popular gem in Renaissance jewellery. On a recent trip to Paris, I went to the gallery in the Louvre featuring Italian Renaissance paintings. Of particular interest to me were the portraits and the depiction of the jewellery. Noble women of the time adorned themselves with jewels and pearls were evident in most portraits. These would be natural pearls of probably from the Persian Gulf. The rather morose woman in the portrait on the left wore a very typical pearl choker and a very long strand. They would appear to be around 10mm. In addition, on the demi-bonnet she wears a brooch with a small cameo, and a large what appears to be a carnelian and a very large, grey pearl drop. In addition she is wearing a golden cross-shaped locket with three very large pear-shaped pearls suspended below. Men also wore jewellery and portraits of the time show them with gem-set small rings, or in the case of nobility or high-ranking clergy, medals or badges of rank often set with rose-cut diamonds and even pearls. Of course the kings and queens of the era had their crown jewels featuring diamonds, rubies, spinels and emeralds. The general rule was the bigger the better and more rather than less. The first gem-cutting machine which could cut facets precisely, was made by Heinrich Arnold of Zwolle, Netherlands 1439. The gem cutting trade was to spread from the Flanders region to Venice, Florence and eventually the rest of Europe. The Renaissance was not all sweetness and light however. While Columbus sailed west to discover a new world, the Inquisition was in full force. Spain expelled Jews in 1492 and Portugal in 1497. Lisbon was the centre of gem-cutting at that point and the Jews were the finest lapidaries. They were taken in by Holland and that is why to this day, the gem trade is so strong in Amsterdam and Antwerp. The Galerie d'Apollon in the Louvre contains a breathtaking display of gemstone objets from the era of Louis the XIV of France. 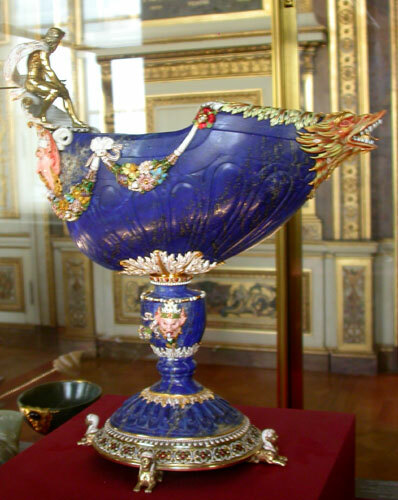 In 1668 Louis brought lapidaries from Italy (Florence) to train French Craftsmen at the Royal Gobelins workshops in Paris. They were employed to created fantastic objects of lapis lazuli, rock crystal, agate, nephrite jade and jasper. They are stunning examples of lapidary, goldsmithing and silversmithing. 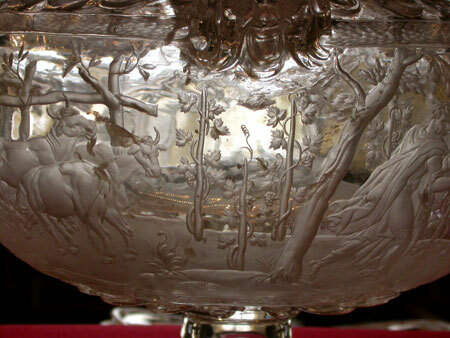 Particularly impressive are the large vessels carved from rock crystal, lapis agate, jasper or jade.. Massive quartz crystals of very high quality were needed to carve these some ornate and elaborate pieces. Cupids, acanthus arabesques and dragons, elephants vie for your attention in these pieces, many of which are magnificent in their sheer wretched excess. This was a particularly over-the top piece of beautiful Lapi Lazuli from Afghanistan embelished with enamelled gold garlands and an impressive dragon presumably as a spout. 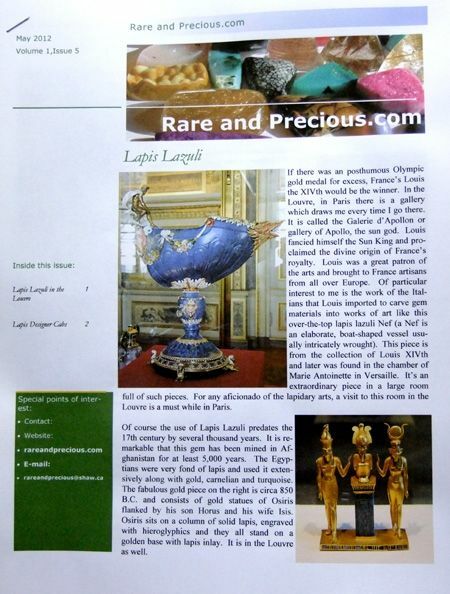 For anyone with an interest in the lapidary arts, this is a must see when you are in Paris. 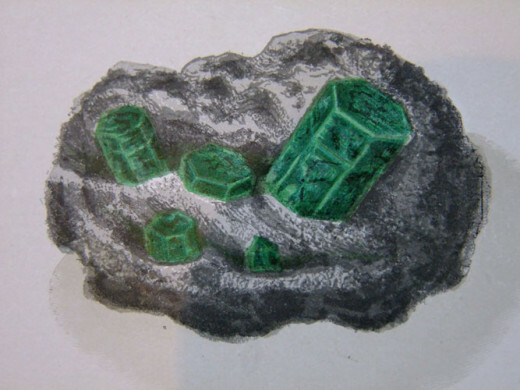 The emerald trade during the Renaissance was particularly fascinating. Within 70 years of the landing of Europeans in the New World, the Spanish countered the Muzo mine in Columbia. Being a good Christian nation, they enslaved the natives and forced them to mine the gems under wretched conditions. Those emeralds were traded around the world and the globe's finest historic emeralds are all Columbian, although now they are found in the Persian and Mughal jewellery of India. The finest collection of emeralds in the world are located in the crown jewels of Iran, which were pillaged from India during the Mughal Empire. The piece illustrated is from the Galerie d'Apollon in the Louvre. It is a wonderfully excessive piece which encompass the entire lapidary oeuvre of the Renaissance, cameo carving, faceted gems, and larged carved decorative agate sections, with fine enamel work. This is one case where the sum of the whole is definitely less than the parts. The emerald themselves are very large, probably in the range of 40 to 50 carats each and are of very beautiful quality - Columbian emeralds no doubt. On April 15th, 1900 the Paris International Exhibtion opened to an eager world. Art Nouveau Style was featured throughout the exhibition and Paris' premier Art Nouveau jeweller, Rene Lalique was about to become world famous. Never before in the world of jewellery since the great Egyptian era has a style so perfectly expressed the jeweller's art. Lalique de-emphasized large and expensive gems and revealed the incredible beauty of more common gems like opal, chrysoprase, horn, moonstone. By combing the subtle more organic properties of these gems with enamel and pate de verre glass, Lalique established himself as the premier Art Nouveau Artist and perhaps the greatest jeweller of all time. His work stands apart with it's combination of women, birds and floral motifs. The best word to sum up Art Nouveau is organic. The inspiration is nature and for the jeweller, it represented a movement away from the mechanistic, geomteric designs of the 19th century and a brief foray into this fantastic organic form. Lalique ultimately found glass to be his favourite medium. It allowed him to create the incredible sculptural forms for a wider audience and in a scale not possible with gems. The use of glass as a gem material is ancient, going all the way back to the Egyptians with their faience inlays, scarabs and amulets. Glass also has properties that gems do not posess, it can be reproduced by using molds and forms. 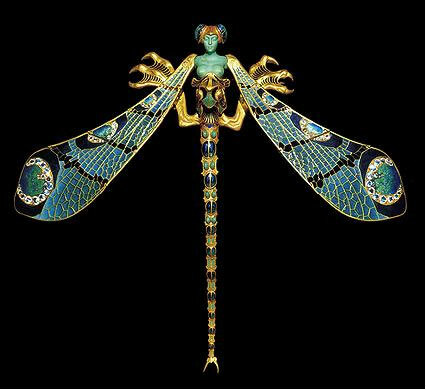 If the Art Nouveau period was dominated by Lalique, the master of Art Deco Period of the 1920' and 30's was Louis Cartier. Moving away from the organic pulled-taffy style of the Art Nouveau, Deco was all about geometry and paying homage to other cultures like India or ancient Egypt. The use of gemstones became extravagant as epitomized by Cartier's 'Tuttl-Fruiti' style. Art Deco jewellery emphasized the gemstones, the metal, often platinum, became just a vehicle to display the gems en mass. Pave diamonds covered the structural surfaces and the big four Diamonds, rubies, emeralds and sapphires were featued in the jewellery. Art Deco objets were another story. 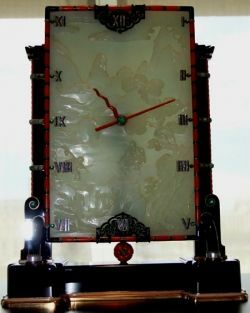 Carties created the most fabulous timepieces, called mystery clocks, using rock crystal, jade, black onyx, and enamel. In 1922, the tomb of Tutankhamen was disocerd in Egypt by Howard Carter. The incredible jewellery unearthed was sensation then as now and Cartier was inspired to create a collection of jewellery and clocks based on the new discoveries. As mentioned earlier in this book, the designs and craftsmanship of the ancient Egyptians was phenomenal. Cartier paid homage to those ancient craftsmen in one of the most important moevements of the Art Deco period known as "Egyptian Revival". In 1986, the Vancouver Art Gallery had a Louis Cartier retrospective. It was a tribute to the enduring fascination of fine jewellery and great design, that people were lined up for hours outside the gallery. Many fabulous pieces, including several mystery clocks were on display. The epitome of Art Deco gemstone artistry was the fabulous Mystery clocks, so-called because the hands floated mysteriously with no visible mechanism. This was a marvelous piece of mechanical legerdemain. The original mystery clock was created in 1913 by Maurice Couet, a French clockmaker. He presented it to Cartier and for the next 35 years, the mystery clocks became Cartier's signature works. Often set on a block of stone such as onyx or jade, the clocks principal aesthetic function was to delight and surprise. Clock hands moved in a transparent void as if suspended in the air. To get to the heart of the mystery, you had to realize that the material used to create the clock face was transparent, flawless rock crystal, sometimes citrine. The quartz front and back was sometimes round, sometimes octagonal. Sandwiched in between those two pieces were two thin rock crystal discs, perfectly polished. One had the hour hand attached and the other the minute hand. There was always a beautiful casing of gold and enamel around the outside of the clock face and therein lay the secret, The two quartz discs were cogged on the edges and driven by a chain that emerged from the base through the supporting pillar or pillars and driven by a spring mechanism hidden in the base. The illusion was perfect and the mystery was marvelous. In 1995, a sheik from Saudi Arabia paid $16,548,750 for a pear-shaped, flawless, 100.1-carat "D" diamond from Sotheby's. The largest polished diamond is the Golden Jubilee diamond. Weighing 545 carats, the yellow diamond was presented to Thailand's King Bhumibal Adulyadej in 1996, to commemorate his 50 years of leadership. The diamond was mounted on a royal scepter and used as part of Thailand's Crown Jewels. One and twenty kilometres beneath the surface of the earth, diamonds are born. Under incredible pressure and intense heat, pure carbon crystallizes to form the hardest and most sought-after of all gemstones. Diamonds are highly coveted for many reasons - they are durable, they are beautiful and they are very hard to find. 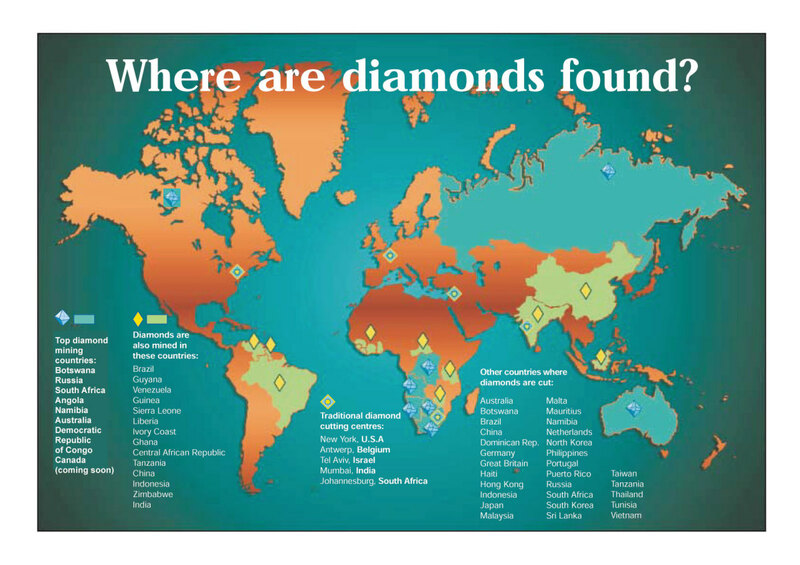 Globally over the last decade, diamond exploration companies have spent billions of dollars looking for diamonds. They have made no significant discoveries. This adamantine gemstone has also been associated with wealth, power and royalty for centuries. Many people scratch their heads about the value of diamonds - although they have many extremely useful industrial properties, at the extreme a very fine red diamond is worth more than $1.4 billion per ounce! Diamonds are so valuable because they possess the three qualities a gemstone must have and a couple that are unique. Those three qualities they share with all gems are beauty, durability and rarity. The two that make diamonds unique are that diamond is the hardest material known and secondly, they have been subject to the greatest marketing campaign of all time - De Beers "A Diamond is Forever" campaign. For twelve centuries, the diamonds that made their way to Europe were primarily from India. In 1631 Jean Baptiste Tavernier, the French gem merchant and adventurer, made his first of six trips to the Orient and was the first European to see and describe the India diamond mines near the diaoomnd trading centre of Golconda. He visited the Raolconda and Kollur mines oalong the Kistna river in the 1660's. This was an alluvial operation, and Tavernier found 60,000 men, women and children under the lash, digging the gravel and washing it in baskets in the river. The diamonds were found in the gravel and then went to gem merchants in Golconda. From there they found their way into the palaces of royalty and nobility in India, Persia and Europe. Then in 1726 the Portuguese found alluvial diamonds in Brazil. Once again these were alluvial deposits. 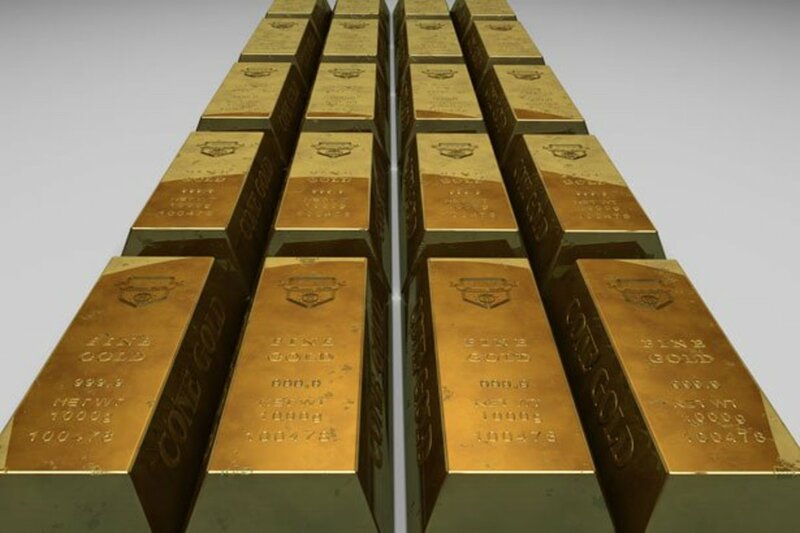 The discovery was made by one Bernardo Fonseca de Lobo while playing poker with gold prospectors. For chips they used pebbles from the stream they were prospecting. De Lobo had been to India, and recognized that some of these pebbles were diamonds. He gathered up what he could and shipped them back to the King of Portugal. This created a sensation and the small town near where they were discovered was renamed "Diamantina". For the next century and a half, Brazil was the world's centre for diamond mining. Once again slavery was used to extract the diamonds, to the benefit of the Portuguese who exploited the African slaves to dig up the diamond deposits. Perhaps the most fascinating person of that era was a black slave by the name of Xica da Silva, who became the most powerful woman in the region. Xica was a beautiful African slave who was taken as the lover of Joao Fernandes de Oliveira. 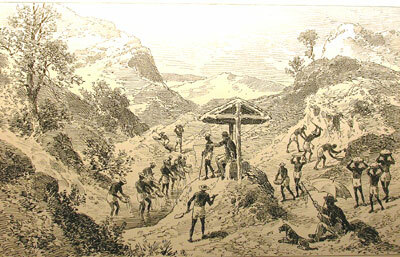 Oliveira had a concession from the Portuguese crown to extract the newly discovered diamonds in the Minas Gerais state. Xica da Silva rose to power through the wealth of Oliveira created by his diamond concession. An excellent Brazilian movie "Xica da Silva" was made in 1976 and a very popular Brazilian TV series was made in 1996 about this fascinating woman. As the end of the 19th century drew near, events across the Atlantic in South Africa were about to usurp Brazil's place as the world's diamond capital and change forever the way diamonds were found and mined. In the middle of the 19th century, the Dutch Boers of South Africa pushed their restless search for farmland into the Northern Cape, a region of vast arid plains with haphazard rock piles known locally as Kopjes. In 1866 a 15 year old farm boy Erasmus Jacobs found a shiny pebble that was to change the course of history for South Africa and create the modern diamond industry. That pebble was a 21 carat diamond which later became known as the Eureka diamond. As is often the case, the person who discovers a significant stone, profits the least. Jacobs gave it to a neighbour, Schalk van Niekirk, who suspecting it might be a diamond handed it off to a man named John O'Rielly a travelling peddlar with an agreement that they would share the profits if sold. O'Rielly forward it to Dr. William Atherstone in Grahamtown and he confirmed it was indeed a diamond. In 1867 it was purchased for Â£500 by Sir Philip Wodehouse, the Governor for Cape Colony. 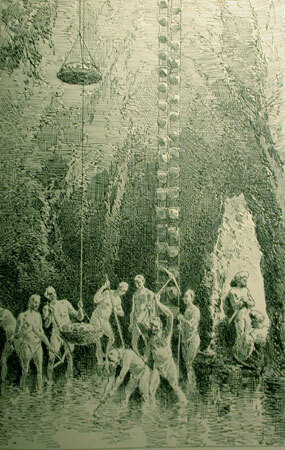 In between, a replica was exhibited at an exposition in Paris and the diamond rush began. We all know today that De Beers is the global giant of the diamond trade, but not before the world of diamond production and exploration was revolutionized by what awaited on a few dusty farms owned by the Boers of South Africa. Ultimately it led to the Boer War, in fact there were two conflicts between the British and the Boers, the first over the discovery of diamonds and the second over the discovery of gold. The history of diamonds for the last century has been dominated by one company - De Beers Consolidated and the early history of De Beers was dominated by one man - Cecil Rhodes. Rhodes was born in England in 1853 and moved to Africa as a youth to combat his asthma. He joined in 1870 his brother there who had a cotton farm. The lure of diamonds soon attracted him to the newly discovered diamond deposits around Kimberly. Rhodes got his start by renting water pumps to the miners and starting buying up claims with the profits from that venture. Over the next 10 years, Rhodes was able to consolidate the many small holdings. He bought a farm from a pair of Dutch brothers Diederik Arnoldus De Beers and Johannes Nicholas de Beers. It contained the Premier kimberlite pipe. The brothers left the farm, but their name stayed on and in 1888 De Beers Consolidated Diamond mines was formed. 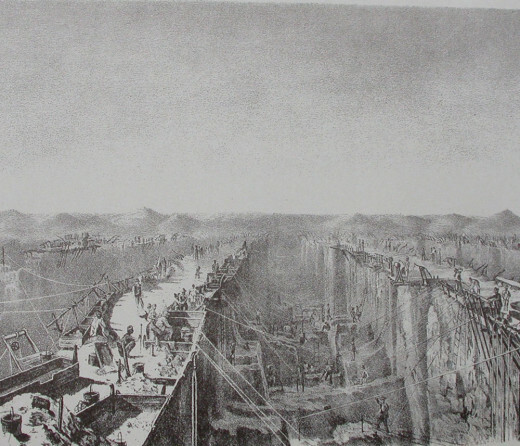 Rhodes figured out that the diamond pay dirt extended under the yellow ground which was decayed kimberlite. Beneath the yellow ground lay the blue ground which was unaltered kimberlite. Many miners believed it was barren, so he bought up claims from the original miners thought their claims were played out because they had extracted all the yellow dirt. Little did they know that the real pay dirt extended for thousands of feet into the heart of what became known as kimberlite pipes. 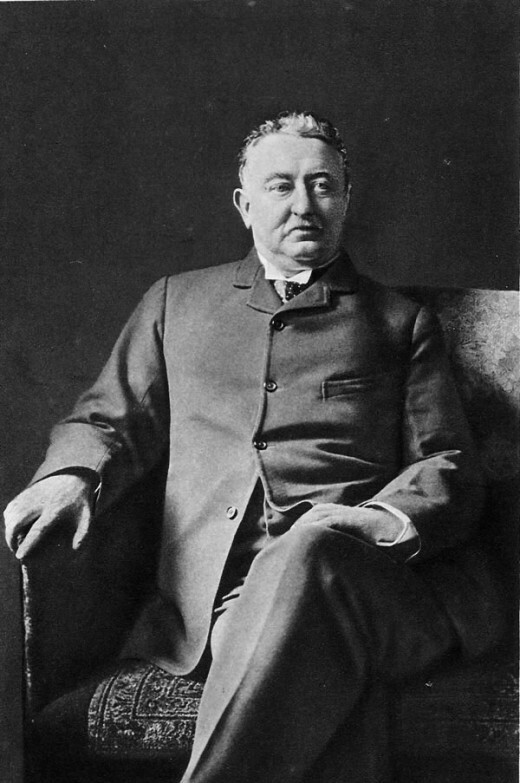 Cecil Rhodes has been viewed through the changing lens of history. For the first fifty years after his death, he was regarded as a colossus who expanded the British empire and left a huge mark on Africa. Not only did he found De Beers which went on to domiante the diamond trade for the next century, he had two colonies named after himself - Northern Rhodesia (now Zambia) and Southern Rhodesia (now Zimbabwe). He founded the Rhodes scholarship at Oxford, University. In the last fifty years however he has come to be regarded as an arch-imperialist and symbol of the arrogance of the British colonial era. A fancy vivid blue, internally flawless, cusshioned-cut diamond weighing 7.03 carats sold in May of 2009 for US$9,488,754, or $US1,349,752 per carat. This price established a new record price per carat for any gemstone sold an auction and the highest price ever for a fancy vivid blue diamond sold at auction. The blue diamond ranks among the most important diamonds ever to be offered for sale by Sotheby's. It was cut from a 26.58 carat rough discovered in 2008 at Petra Diamonds' historic Cullinan diamond mine in South Africa, the world's most consistently reliable source of blue diamonds. The Gemological Institute of America (GIA) has graded the stone as fancy vivid blue in colour and internally flawless in clarity, the highest possible grading for a blue diamond. JOHANNESBURG - Petra Diamonds Ltd. says a diamond the size of a chicken egg has been found at South Africa's Cullinan mine. 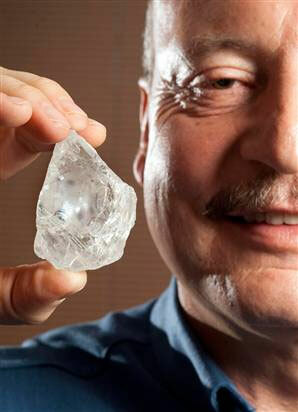 The Cullinan is also where the world's largest ever diamond was found - the Cullinan, which was over 3,000 carats! A prospector from Kelowna, B.C. spent 10 years tracking down diamonds in Canada. Chuck Fipke's search eventually led him to a lake in the North West Territories in Canada's far north. Fipke had been following a trail of tiny grains of stone known as indicator minerals. The region had been covered by a glacier as recently as 8,500 years ago. As the glacier crawled across the land, it scraped the surface of the terrain. It passed over some kimberlite pipes and dragged along a suite of minerals that are associated with diamond deposits. These include purplish to red pyrope garnets, bright green chrome diopside and the metallic black ilmenite and olivine. Tiny grains of these minerals were scattered as the ice crushed and dragged the rock at the surface. By systematically sampling the soil, a mineral trail can be detected and with luck a perseverance lead a diamond prospector back to the source - a kimberlite pipe. This was a challenge in the NWT since kimberlite is softer than the hosting archean granite, the roughly circular pipes were ground deeper by the glacial scouring than the surrounding rock and formed depressions. As the glaciers melted those depressions became lakes. In 1991 Fipke and his partner Stuart Blusson eventually tracked down a circular lake at the head of a mineral train. The train was rich in indicator minerals. The exploratory holes were drilled through the ice of that lake and yielded 81 diamonds and the great Canadian diamond rush was on. That discovery led them to a body of water known as Lac de Gras (literally Fat lake) where they discovered a group of very rich pipes which became the Ekati diamond mine, now operated by the Australian mining giant BHP. Fabulous gemstone set jewllery by some contemporary master goldsmiths. The highest price per carat ever paid for a ruby was set on February 15, 2006, when Laurence Graff, a London jeweler, paid a record $425,000 per carat ($3.6 million) for an 8.62-ct. ruby, set in a Bulgari ring, at a Christie's auction in St. Moritz. The Carmen Lucia ruby in the Smithsonian Institute is a 23.1 carat Burma Ruby donated in 2004 by Peter Buck, founder of the Subway Restaurant chain. The colour of gemstones is created by trace elements which are present and incorporated when the crystal is being formed. Corundum crystals very rarely encounter chromium in their genesis but when they do, that is when rubies are formed. By some quirk of nature, large clean ruby crystals are extremely rare. They are generally full of cracks and flaws. Nature has found a way to purify these crystals via the alluvial process. When a ruby crystal works its way from the matrix into which it was born, it will begin a journey impelled by water and gravity. As it tumbles and rolls down the mountainside and into a river or stream, the cracks increase and smaller fragments break free. This process is continually repeated as the ruby gets tumbled and rolled in the rushing water, eventually forming a pebble relatively intact and free from major cracks. However, even in a very large crystal, the relatively clear and clean parts are small. It is surprising to realize that there are diamonds over 500 carats, but the largest gem ruby, the Carmen Lucia ruby in the Smithsonian Institute, is a mere 23 carats. During the formation of corundum crystals, tiny needles of the mineral rutile (titanium oxide TiO2) are included. When cut en cabochon, this silky inclusions create an optical phenomenon called astersim. A star is formed. 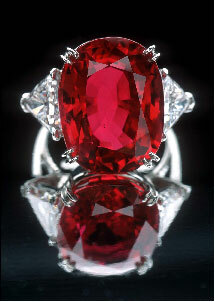 Possibly the most beautiful and Impressive is the Rosser Reeves star ruby which resides at the Smithsonian. It was donated in 1965 by an advertsing executive, Rosser Reeves and weighs 138.70 carats. A Canadian company is looking to establish a new source for gem grade rubies. 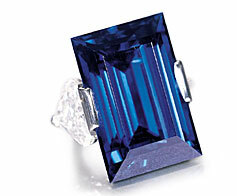 The highest price per carat ever paid for a sapphire was $135,000 for this 22.66 carat Kashmir Sapphire, sold by at auction by Christies in May of 2007. The total value was $US3,064,00. The Blue Giant of the Orient, a 486.52 carat cushion-cut gem owned anonymously was found in 1907 in Sri Lanka. It went up for auction at Christie's in Geneva on May 19th, 2004 but was unsold. It later changed hands anonymously for one million dollars. Largest Rough Sapphire: The world's largest rough sapphire crystal, weighs 42 pounds ( 19 Kg) or 95,000 carats is from Sri Lanka, and resides in the National Gem and Jewelry Authority of Sri Lanka. A good and concise review of the sapphire information. Any corundum that is not red is called a sapphire (red corundum being ruby). Blue is the colour which most people associate with sapphire and it is certainly the most common found in jewellery stores. However sapphires can also be green, pink, orange, yellow, colourless, purple, bicoloured and even have a colour change. The majority of blue sapphires on the market today come from Australia. These are the dark, inky blue stones you see in most jewellery stores. The finer gems the more brilliant, medium blue stones are found in Sri Lanka. Many of them are shipped or smuggled to Thailand, where they are genrally heat-treated to improve the colour and faceted. Most coloured stone mining in the world involves a bunch of men digging gravel or a pit by hand and concentrating the heavy minerals with a simple pan or grizzly. This is a classic example. Corundum comes in many colours, blue being the most common. Of all the fancy colours, the most valuable is the Padparadscha sapphire. This is a Sinhalese word meaning colour of the lotus. A classic padparadscha is a delicate pinkish orange of Sri Lankan origin. In the late '70s, an intense orange sapphire was discovered in Tanzania and was also marketed as Padparadscha. 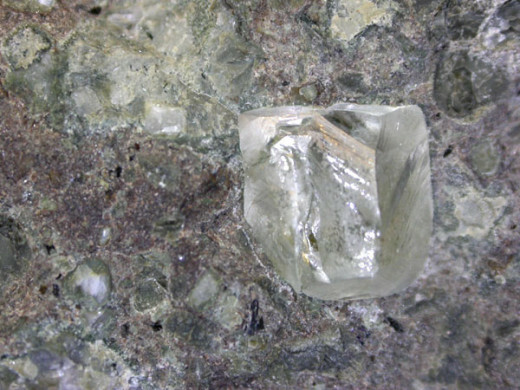 At the top end they may fetch $30,000 per carat. In the American Museum of Natural History, there resides a 100 + carat padparadscha collected by JP Morgan. It is a remarkable gem and well worth seeing while in New York. As you can see from the photos on this page. In the American Museum of Natural History, there is a case of what are called phenomenal stones. 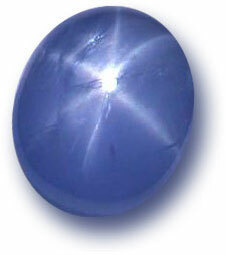 Phenomenal stones are gems that exhibit an optical phenomenon, such as asterism (a star), or cat's eye effect. 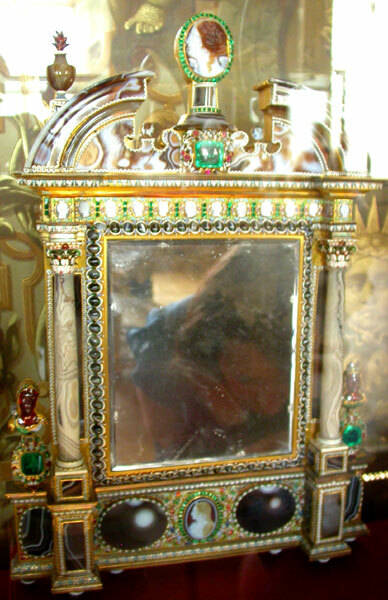 The stones in that case could be named for the effect they have on museum patron who comes across this case. 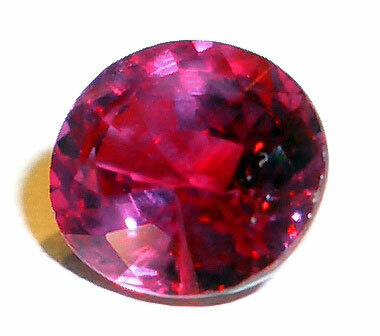 It includes the Star of India, the DeLong star ruby and a very large chrysoberyl cat's eye. I have watched people approach this exhibit and more often than not, as they peer into the case, their jaw drops as they look at some of the most impressive and beautiful gems in the world. There is something other-worldly about stones like this and star sapphires certainly possess that extraordinary characteristic. The gem pictured here is the Star of Bombay. It's not really from Bombay, but originally from Sri Lanka. Nor for that matter is the Star of India an Indian stone either but was found in that island nation formerly known as Ceylon. Primarily in vugs or cavities that trap the hot magmatic gases and fluids that form minerals as they cool down and crystallize. 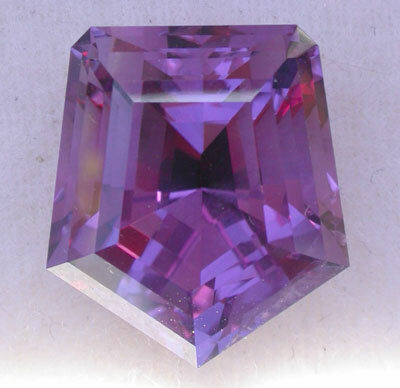 The word "amethyst" comes from the Greek and means 'not drunk'. It was reputed to ward off drunkeness. The Greek myth of the origin of amethyst tells the tale of Dionysus, the god of wine, who in a rage decalres he will slay the first person he encounters. He summons tigers to tear them apart. A beautiful young maiden , Amethyst, happens along and begs to be spared the cruel claws of the tiger. Dionysus grants her wish and turns her into a beautiful clear crystal of quartz. Remorseful, he pours a cup of wine which stains the crystal purple, thus the colour of amethyst. 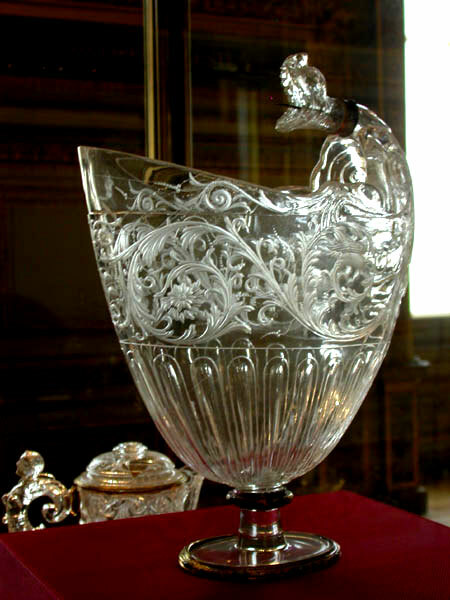 In the age of princes and kings beautiful objets carved from rock crystal were created to fufill the demand for luxury. What could be more luxurious than a decorative bowl, goblet or vessel carved from from a huge, flawless quartz crystal. In the Galerie d'Apollon, Louis the XIVth's tribute to himself in the Louvre are many stunning examples of rock crystal ojet d'arts by the Italian gem carvers that Louis installed in an atelier in Paris. No one did luxury like Louis, the self-styled Sun King and France's ruler by divine right. Louis was King of France at the height of her European power in the last half of the 17th and early 18th century. These magnificent quartz objets were mere trinkets to Louis whose idea of luxury was building the Palace of Versaille, a monument to conspicuous consumption unsurpassed today. The collection of rock crystal objets in the Louvre is stunning and one can only imagine the size of the original quartz crystals, the time it would have taken to hollow them out and the craftsmanship and artistry of the master lapidaries and goldsmiths who created these masterpieces. When I saw them, I felt each one deserved its own case and was worthy of hours of study and contemplation. I aggregate, they are devalued by the abundance of these magnificent pieces, each one a tour de force. I suppose the Louvre is like that, because you can walk into a room of Van Gogh paintings, each of which is worth a king's ransom, or see multiple works of art by Michaelangelo or da vinci. On a relative scale, a fabulous rock crystal bowl which might sell for hundreds of thousands is still a mere trinket compared to the Mona Lisa upon which a price cannot be put. The last time it was sold was in around 1516 to Francis I King of France. He paid 4,000 ecus (about $395,000 in today's value)! Citrine starts its life as either a smoky quartz or amethyst crystal. By the judicious application of heat, the colour will change to a light yellow or sometimes a deep orangy-brown. These darker, deeply coloured stones are known as Madeira citrine. There is a brighter yellow-orange variety known as Palmeira citrine. 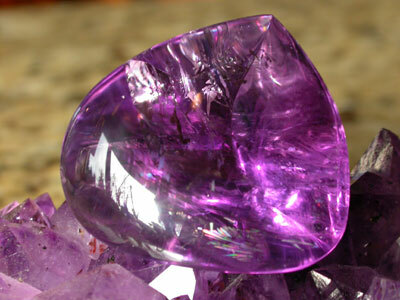 As with amethyst, most citrine originates in Brazil or Uruguay. During Expo "86 in Vancouver, Sri Lanka had a paviIion which featured many spectacular gemstones from that country. I was contacted by a jeweller who said that there was a celebrity in town who interested in buying a couple of stones. I met with her manager and the star in question. It was Ann Miller, who had just completed a triumphant role in the Broadway musical Sugar Babes, with Mickey Rooney. Ms. Miller was interested in buying a 1500 carat citrine which was being offered at the Sri Lankan pavilion for $5,000. I had just seen a similar sized stone in New York a couple of months earlier and new that this price was way out of line. My job was to help the former movie star negotiate a better price. In the end Ms. Miller bought the stone for $1,500. She was happy, her manager was happier and the representative of the Sri Lankan pavilion was happy to see the last of me. Nearly everyone has found an agate or chalcedony of some sort while poking along the beach or a pile of gravel. There's always a thrill to it, finding this pebble that is so much more interesting and attractive than the thousands of other pebbles surrounding it. This can often lead to a lifetime addiction the rocks and many a rockhound, geologist, jeweller or gem dealer was created this way! From a gemmological perspective, agate is a banded form of chalcedony and a member of the chalcedonic triad of agates, jaspers and chalcedonies. The term agate is applied to a variety of chalcedonic stones under the various names such as moss agate, plume agate, Montana agate, fire agate and many local varietal names (like ellensburg blue, holly blue, etc.) 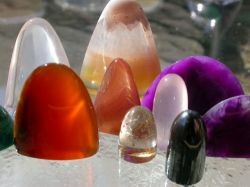 Agates are the most common of gemstones and can be found in a stunning variety of colours and sizes. They also have a storied history, having been used for millennia to create gemstones, cameos and objets d'art. @AceofHearts: Thank you for the kind words. Very cool lens. I enjoyed it very much, every word. @LynetteBell: I'll get there eventually! @julieannbrady: I share your fascination - as you can see! I am fascinated by the magnificent world of gems. Such beautiful stones and rocks. I never knew about star rubies... only star sapphires. Excellent lens! Very informative and complex. Thanks for giving a chance to learn something new today! A very lovely and informative lens with stunning pictures! Get all possible information about India Tourism at here only. Besides silversmithing, I really enjoy lapidary, cabbing and setting my own gems and stones. Faceting is on my to do list next year. fantastic! got my thumbs up! A lot of good information here. I'm a jeweler and am always looking for information on different gems. Thanks for putting this together! Wondrous -- beautiful, educational and stunning! Amazing lens. Enjoyed experiencing it. Very informative lens. 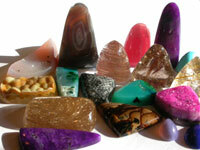 I love stones and have my own lens on healing stones. Well written and you deserve an angel blessing - congratulations. Wow...what a great and thorough lens! Favoriting and blessing. Thankyou for a this lens- I love minerals! Thanks for sharing all this wonderful information! Your lens is amazing and full of great information. That's very exhaustive list for gems- great job. You really spent some time gathering this information! For those looking for unique gems for jewelry this should be standard reading so they truly know what they are getting. Well, I intended to give you 5 stars, but there doesn't seem to be a facility on the lens for doing this. I pressed the star sign at the foot of the page, and all this did was to favourite it, which I don't think is quite the same thing. This is a really good lens and beauiful pictures. I am going to link to it from my lens "How Venetian Glass Beads are made" http://www.squidoo.com/how_venetian_glass_beads_ar... as I am sure the same people would be interested. Also giving you 5 Stars. What a fantastic lens! I'm looking forward to seeing more of your work. You obviously know your stuff!! 5 stars!